This is a brand new, recently completed 4 bedroom Kalkan Villa Amelia. Villa Cagla is situated just a 15 minute stroll from the centre of the enchanting Kalkan village and harbour. This is a brand new, recently completed 4 bedroom Kalkan Villa Amelia. 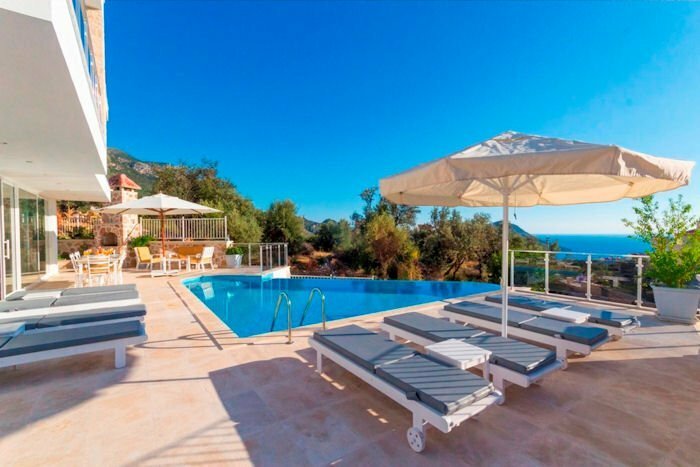 Villa Cagla is situated just a 15 minute stroll from the centre of the enchanting Kalkan village and harbour, which is packed with delicious restaurants and is known as a premier holiday resort in the Turkish Riviera. Extremely well equipped, the villa has been designed and furnished to a very high standard and the accommodation offers bright, comfortable and contemporary living. The Kitchen is has all the equipment needed for self-catering including a large fridge freezer, electric oven and gas hob, extractor, microwave and dishwasher. There is a dining area comfortably sits for 8 people. There are double bed, side units, roof top terrace with two sun loungers and parasol, wardrobe, ensuite toilet/shower. Kalkan has a small but pleasant beach only a few minutes walk from Villa Cagla. Or, on the Western side of Kalkan, is Kalamar beach, which has a beach club and a couple of waterside restaurants to choose from.